This page will appear in German as soon as possible. 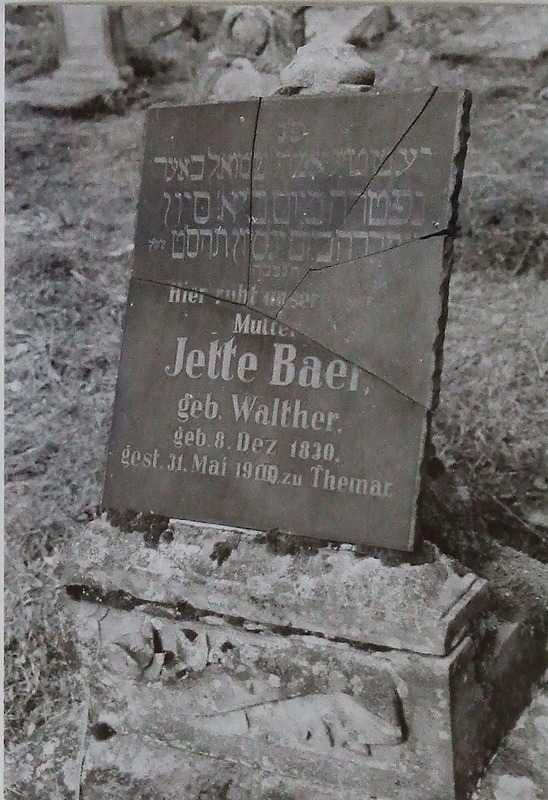 The family of Samuel & Jette Bär/Baer may well be the first Jewish family to settle permanently in Themar permanently in the second half of the nineteenth century. 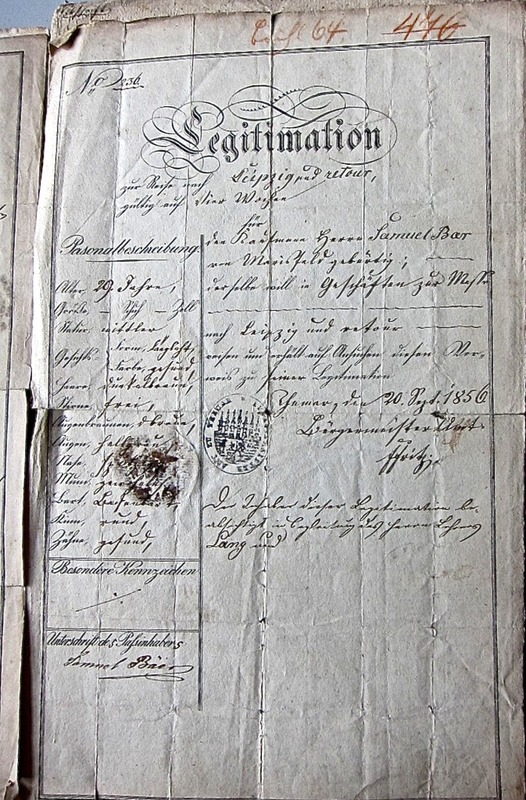 A discovery in the Themar City Archives in June 2014 strongly indicates this: The evidence is a travel certificate issued on 20 Sept 1856 (at right) that allowed 29-year-old Samuel Bär to travel from Themar, his place of residence, to Leipzig to visit the famous trade fair. (Anyone, regardless of religion, travelling to Leipzig from elsewhere in Germany, required such a document.) Samuel’s signature was witnessed by Simon Lang, the Jewish religious Lehrer/teacher of Marisfeld at that time. The back of the document consists of renewal stamps for the subsequent three years. The document not only identifies Samuel Bär as the first Jew to settle in Themar but it also sets the date for Jewish settlement in Themar earlier than previously assumed. Most accounts state that the first Jewish families came to Themar from Marisfeld in the early to mid-1860s and often link the migration to the fire in Marisfeld that prompted families, both Jewish and non-Jewish, to leave the village for larger centres. Both Samuel Bär and Jette Walther were born in Marisfeld and both came from large, well-established families. 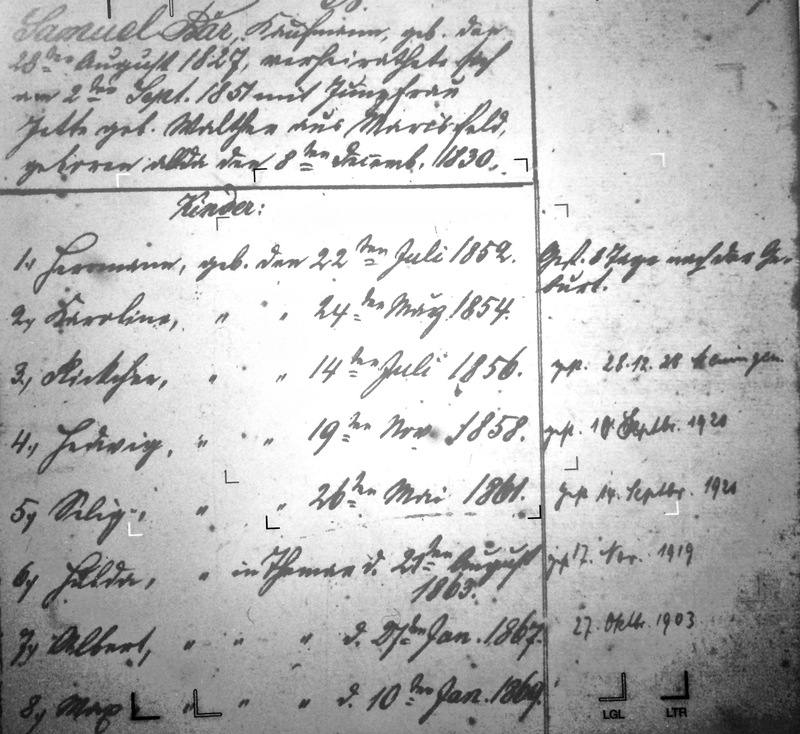 In the Family Register, Samuel Bär was identified as a Kaufmann/businessman. The decision to move from Marisfeld to Themar was probably a conscious strategy to take advantage of the loosening of laws restricting Jewish settlement to ‘designated’ villages such as Marisfeld. Settlement in the Kleinstadt of Themar offered strong opportunities for socio-economic prosperity for all family members. A change in the writing and spelling — but not the pronunciation — of their name occurred with move to Themar. The ‘ä-umlaut’ of Bär was replaced with the ‘ae’ of Baer. Whether they did this to distinguish their family from the other Bär families of Marisfeld or for stylistic reasons is unclear. In these pages, you will find that, while the intent is to use “Baer” consistently, the spelling wobbles as various records use the various possibilities. 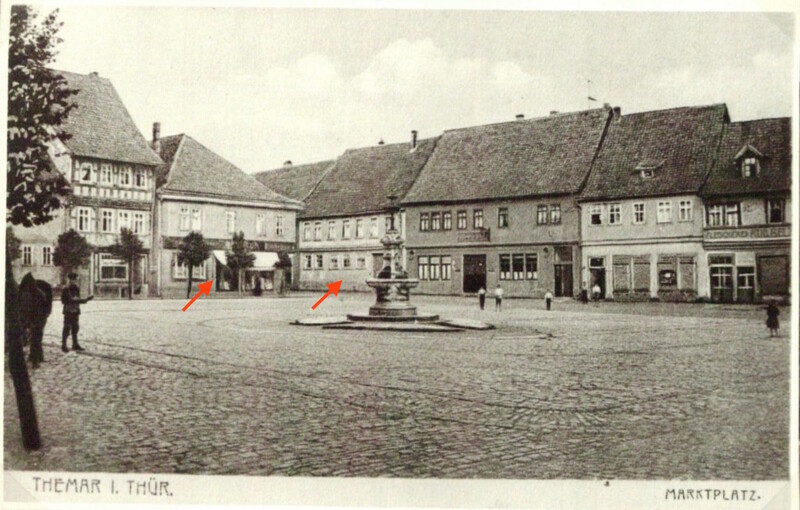 Today the Baer family is associated with the building at Markt 8, (left arrow in image below), the building on the northwest corner of Marktplatz & Bahnhofstrasse. But a ‘census’ of Themar’s residents in 1875 tells us that Schnittwarenhänlder/textile merchant Samuel Bär was living at Marktplatz 187 on the east side of Bahnhofstrasse (right arrow in image below) When exactly the family moved into Markt 8 is not known. The couple had seven (7) children, and their births are recorded in the the official records of the Jewish Congregation of Marisfeld (see image at left). It is possible that Jette returned to Marisfeld — to family members and possibly a known and trusted midwife — to birth her children in the late 1850s and early 1960s. The children attended the school near St. Bartholomew church. They received their religious education from Leopold Ludwig, who lived in Marisfeld until 1877, and then moved to Themar to establish the formal Jewish congregation there. As adults, the Baer children either settled in Themar or in the nearby towns. Of those who remained in Themar, Karoline married Louis Bär (b. 1849 in Marisfeld), and her family became most involved with the S. J. Baer business. It is possible that Hulda, b. 1863, who died in 1918, lived most of her life in Themar. Max, a child of 10 or so when the family moved to Themar, grew up there and was in Themar in 1901 when a son, Siegfried, was born. Three children moved to nearby towns: Hedwig, who married Adolf Stern in the 1870s, moved to Hildburghausen; Ricca married Simon Müller and moved to Meiningen, where they established a successful business. Selig also moved to Meiningen. We know little of either Hulda or Albert other than dates of birth and, in Hulda’s case, death. Samuel Baer died in 1883, age 55; Jette lived until 1909. The family of Samuel & Jette Baer was a key founding family of Themar’s Jewish community, As well, it was among the most successful families in Themar, Jewish or non-Jewish. We do not yet know the full story of the family in the close to ninety (90) years in which they lived in Themar. But ongoing research should enable us to understand its story and contribute much to understanding the larger story of Themar and its Jewish community. Human, Rudolf Armin. Geschichte der Juden im Herzogtum Sachsen-Meiningen-Hildburghausen. Hildburghausen: Kesselring, 1898/ reprinted Weimar: F. Fink, 1939. Jüdische Gemeinde Themar (Kr. Hildburghausen), Matrikel, 1876-1937, Staatsarchiv Thüringen, Meiningen. Wolf, Siegfried. 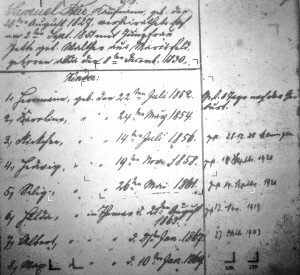 Juden in Thüringen 1933-1945: Biographische Daten. vol. 1. 2000.